The local Cape Town football team, Ajax Cape Town have been given the go ahead to use the Cape Town stadium for the 2010-2011 season and have so far remained undefeated there winning two of their games 2 -0 and drawing 1 – 1. Here we can see the Ajax team before a game at the stadium. The view of the signal hill is impressive as you get a real sense of the shapes and style – but up close and inside the stadium its a whole different aspect! The sheer size and complexity of the curved design really takes your breath away! Cape Town Stadium is ultra modern as well as stylish and having already held three extremely successful test events over the last three months it will be clearly be the jewel in the crown of all South African (and African?) stadiums. 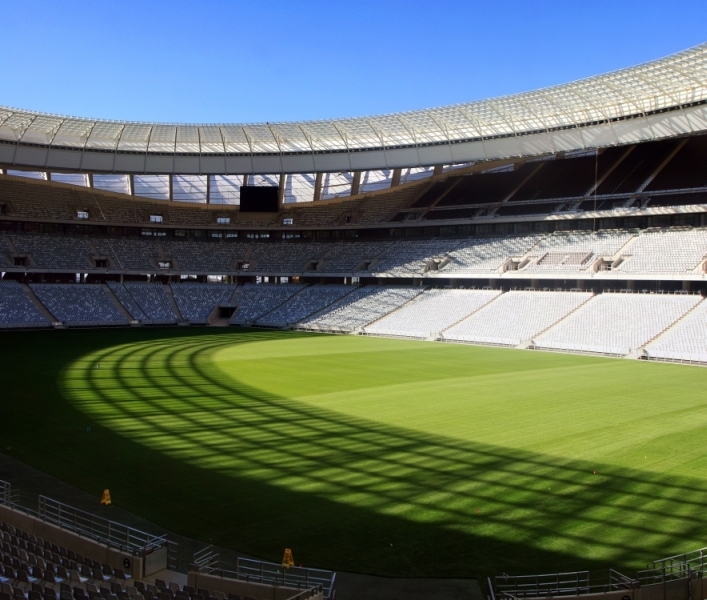 Tours of the 2010 world cup venue, the Cape Town Stadium, are underway from Tuesday to Saturday up untill the 14th May. The tours are at set times 10am, 12pm and 2pm and the tour includes access to the stands, players’ changing rooms, VIP/hospitality area and the feared prison cell, sadly you wont be able to get down to the pitch! It is reported that all tours are fully booked, but if you arrive early there are always cancelations with your best bet being on a Saturday. 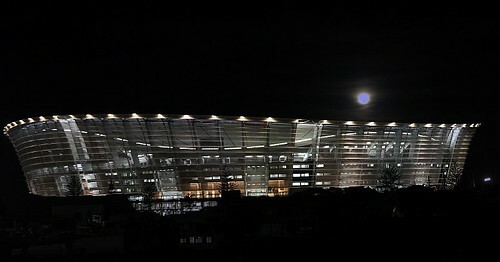 The Cape Town Stadium is a newly built stadium for the 2010 World Cup and was built in the same area as the old Green Point stadium in the Atlantic seaboard suburb of Green Point. The beautiful new stadium can be found between Signal Hill and the Atlantic Ocean, close to the Cape Town city centre and to the Victoria & Alfred Waterfront. The stadium has seating capacity of 69,070. Once the World Cup is over seating will be removed in order to bring the maximum capacity down to 55,000.